Dr. Shirin Ebadi became Iran’s first female judge in 1975 in Tehran. Following the Iranian revolution in 1979, she was demoted and assigned to a secretarial post. She eventually became a defender of human rights for those persecuted by the government, setting up her own Defenders of Human Rights Center in Tehran. In 2003 she was awarded the Nobel Prize for her efforts on behalf of democracy and human rights. 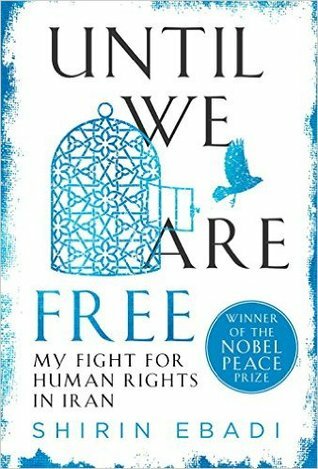 This book, written in exile from Iran, is a personal story recounting how the Iranian government reacted to her Nobel win since 2003. Constant surveillance and persistent attempts by the government to discredit Ebadi’s reputation and stymie her legal work led finally to the government targeting her daughters, husband, sister, and friends by search and seizure in their homes, abusive interrogation sessions, and jail time. All of these attempts at intimidation failed because Ebadi believed that if she stopped her work due to one or another intrusion by the government, her accusers would recognize her weak spot and would intensify their attacks even as she withdrew from the arena. There was nothing for it but to continue. Eventually the government confiscated the passports of her family members, and while she was out of the country attending a seminar just before the 2009 presidential election, brought a case against her. Facing jail in Iran should she return, Ebadi has been residing in Great Britain while continuing her work, every day hoping to be allowed to return to Tehran. This simply written account of her years of protest is not a screed, but a quiet and insistently-argued call for reason. In detailing the annoyances and illegal attempts to curtail the rights of citizens in Iran, we get the sense of a very well-educated and politically-astute populace who see the limits of their current leadership. The protests during the 2009 election demonstrated that more than a few people felt their votes were not registering when Amadinejad was elected president. As protest, individuals would get on the roof of their apartment buildings and yell out “Alloaho akbar!” often late at night, every night. When Amadinejad called his oppnents ”khas o khasak”, or dust and dirt, a young musician made a music video called “Khas o Khashak” that quickly went viral. Ebadi addresses the nuclear agreement signed between the United States and Iran, saying that she has always thought Iran had the right to use nuclear technology for power. Only lately has she learned that nuclear power has significant downsides, especially in a country with a major earthquake fault lying directly beneath it. Upon learning that nuclear power is protested mightily in the U.S., poses dangers like those exhibited at Fukushima in Japan, and will be phased out entirely in Germany by 2022, Ebadi thinks Iran’s leadership should be more aggressive in pursuing renewables, considering their location in the sun spot of the world. When it came to the 2013 election of the moderate-sounding Hassan Rouhani, Ebadi says it only took until Rouhani had appointed his cabinet for everyone to see just how (not)moderate he was. And yet Ebani can see the enormous challenges a purported moderate like Rouhani faces in Tehran today, and suggests he might begin with something he can actually tackle, like human rights abuses: late-night raids, confessions extracted through torture, and unofficial detentions. Keep the outmoded and discriminatory laws if necessary, but allow cases to be argued in court at least. There is always “something that needs to be done first” in every list of priorities, but beginning is the real test of leadership. Iran can be great again, Ebani suggests, if the government would just get out of the way of the citizenry, and allow sects, minorities, and women to contribute, and let freedom ring. Literacy among women in Iran is ninety-nine percent and sixty percent of university graduates are women. Yet the climate for women in Iran is deteriorating by the day, with musicians unable to perform on stage, women civil servants unable to work alongside men, and no women allowed to work in cafés or restaurants in Tehran. A great deal of damage can be done to a society and a country’s future without the full complement of society members able to have their voices heard. You might think that Iranians and Saudis were closest of friends from their policies, rather than arch rivals. Whoever figures out first that diversity makes for resilience, and acts on it, wins.